Chris and I left after work on Thursday afternoon and headed into Utah on I-70. We were driving into a pretty strong head wind the entire way and I sure hoped this wind wasn’t going to stick around for the entire trip or it wasn’t going to be a very fun time on the river! We arrived at Ruby Ranch shortly before sunset and quickly set up our tents before it started to get dark out. We had expected to find Steve and Nic waiting for us, but they had not returned from the shuttle yet and would not arrive until just after it got dark out. Once the sun was down it got a little windy out again and then started to smell like smoke, which was most likely coming from the Pole Creek Wildfire that was burning near Spanish Fork. After catching up for a little bit, we went to bed around 9:30. Welcome to Ruby Ranch! You are trespassing on private property. We spent the first night of the trip camped near the boat launch at Ruby Ranch so we could get an early start on Friday morning. Chris and I watched the sun set over the Green River while we waited for Steve and Nic to arrive from running the shuttle. There is an exquisite charm in our ride to-day down this beautiful canyon. It gradually grows deeper with every mile of travel ; the walls are symmetrically curved and grandly arched, of a beautiful color, and reflected in the quiet waters in many places so as almost to deceive the eye and suggest to the beholder the thought that he is looking into profound depths. On Friday morning we packed up our camp, inflated our boats and packed all our gear that we would need for the next four days into the boats. We were on the river by 9:45am with clear blue skies with a touch of haze and smoke hanging around. Thankfully there was no wind this morning! However, even without any wind, the river was moving a little slower than I had hoped and we had to paddle more than I would have liked to keep moving, especially since I had planned an ambitious first day. Two inflatable kayaks ready to go! Steve getting his raft ready for the trip. After a few miles of open desert views we entered the beginning of Labyrinth Canyon. At Bull Bottom we stopped to find a few petroglyphs. After hiking along the base of the cliff and missing them twice, Steve was the first one to spot them. They were pretty faint and hard to see. Chris floats below the sandstone walls of the canyon. Our next stop was at Placer Bottom where we found the remains of an old placer mining operation. We also found a couple nice petroglyphs nearby. There wasn’t a good place for us to have lunch at Placer Bottom, so we floated down the river a little further and stopped for a quick lunch on a nice sandy beach before we continued on through Trin-Alcove Bend. We made a quick stop at the mouth of Three Canyon to search for another petroglyph. Chris stands on a narrow ledge next to the petroglyph which is hard to see in this light and is located to the left of him. Back on the river and looking for a campsite. I had hoped to visit Junes Bottom on this trip, but we were already running behind so I decided to skip it this time. We found a nice sandy campsite on an island in the river just downstream from Junes Bottom and across from Slaughter Bottom and F Canyon. Looking across the river to the mouth of F Canyon. There was a good large campsite at Slaughter Bottom in the cottonwood trees on that side of the river, but it was much higher than the current level of the river and staying there would have meant hauling most of our gear up a steep trail. We were much happier on the sandy island, especially since it was already in the shade when we arrived. After setting up camp we rested from a long day of paddling. We were all pretty exhausted at this point and hadn’t travelled as far as I hoped we would. We had BBQ Beef sandwiches for dinner and watched the sun set. Even though we were tired, it was still a great day on the river and I know that I slept very well this night! A reflection on the river at dusk. Our campsite under the stars. It was a beautiful night! The course of the river is tortuous, and it nearly doubles upon itself many times. The water is quiet, and constant rowing is necessary to make much headway. Sometimes there is a narrow flood plain between the river and the wall, on one side or the other. Where these long gentle curves are found, the river washes the very foot of the outer wall. A long peninsula of willow-bordered meadow projects within the curve, and the talus at the foot of the cliff is usually covered with dwarf oaks. The orange-colored sandstone is homogeneous in structure, and the walls are usually vertical, though not very high. Where the river sweeps around a curve under a cliff, a vast hollow dome may be seen, with many caves and deep alcoves, which are greatly admired by the members of the party as we go by. The sky was perfectly clear all night and the air was very calm. We woke up on Saturday morning, which also happened to be the Autumnal Equinox, to catch the sunrise and so that we could get an early start to try to make up a few extra miles on the river. It looked like it was going to be another warm day with a clear sky. My tent below the cliffs bathed in the early morning alpenglow before sunrise. Nic floats below a large alcove shortly after leaving camp. Our first stop this morning was at a large inscription panel left by passengers of the Launch Marguerite in November 20, 1909. As we were returning to our boats from the inscription we saw a deer with two fawns walking in the middle of the shallow river. Once they noticed us they ran across and then floated/swam through the deeper part until they reached the opposite shore and disappeared into the brush. A morning float down the Green River. Passing by a Blue Heron in the middle of the river. Next we stopped to have lunch near the River Register. Here’s a closeup view of some of the more interesting carvings found here. As we continued down the river I had also hoped to stop and explore the mining ruins found near the mouth of Hey Joe Canyon, but unfortunately the water was currently too low and it would have been a muddy mess trying to get there, so we decided to skip it this time. It’s not really a big deal since there is also a road that goes there and I can always visit it that way in the future. I was pretty excited when we stopped to visit my fifth Denis Julien inscription! This one was created on May 16, 1836 and is in really good condition since it’s well protected under a large overhang. After checking out the Denis Julien inscription it was time for us to go for a swim so we could cool off before continuing on down the river, and it felt great! I was the only one that climbed up to the large Launch Marguerite inscription from 1909. It was easily visible from the river, but I wanted a closer look. We found a great campsite this evening on the other side of the river from Spring Canyon Point in the Horseshoe Canyon North Wilderness Study Area. Just like the previous evening, this campsite was already in the shade when we arrived, which was nice. We had a hearty dinner of spaghetti and meatballs that I brought and prepared, had a small campfire and went to bed early. It had been another long day with a lot of paddling, but we did make up a few miles. A view from our camp kitchen at this evenings campsite. I found a good spot for my tent in the middle of a large alcove. It was another beautiful night camping in Labyrinth Canyon. I never would need to use the rainfly on my tent the entire trip! About six miles below noon camp we go around a great bend to the right, five miles in length, and come back to a point within a quarter of a mile of where we started. Then we sweep around another great bend to the left, making a circuit of nine miles, and come back to a point within 600 yards of the beginning of the bend. In the two circuits we describe almost the figure 8. The men call it a “bowknot” of river ; so we name it Bowknot Bend. On Sunday morning I woke up before sunrise and there were actually clouds in the sky, so I spent some time photographing along the banks of the river near camp. This was the warmest night of the trip so far and it was pretty humid in the morning, too. This was a day of the trip that I was really looking forward to since our first stop would be to hike to the top of the Bowknot Bend Ridge and I’ve wanted to do that for a very long time! A beautiful sunrise along the river and the first morning with a few clouds in the sky. Looking up past the towering canyon walls at sunrise. After breakfast and packing up camp we were back on the river for another full day of floating and paddling. Our first stop this morning was one I have been looking forward to for a long time. We hiked up the trail to the top of the Bowknot Bend Ridge. Here is a view from the saddle. Here’s a panorama from the top of the ridge showing the river on both sides. I hiked to the opposite end to find a few more inscriptions, like these from Harry Aleson and Georgie White. Georgie White was the first woman to row the full length of Marble and Grand Canyons in 1952. She made her name in the early 1950s when she lashed three rafts together to achieve better stability in big rapids and began taking paying customers to ‘share the expense’ of running the river. …and this one from Neville Wolverton in 1905. Finally there was this one from the Kolb Brothers, who mentioned making this carving in their journals (The Brave Ones) from their re-creation of the historic John Wesley Powell Expedition in 1911. Here is one last panoramic view from the opposite end of the Bowknot Bend Ridge. What you can’t see from this view is that the river on the left goes around a very large bend and comes back in on the right. It takes about seven miles for the river to travel only a couple of hundred feet. 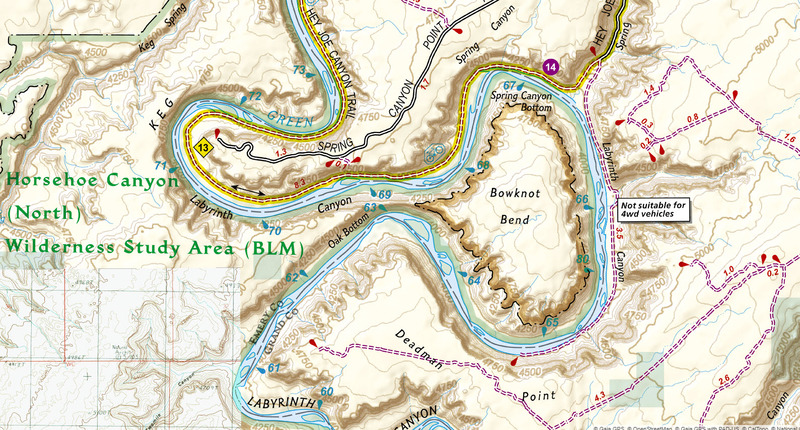 For those not familiar, here’s a topographic view of Bowknot Bend. We hiked to the top of the narrowest part of the bend. Nic enjoys the view from the top over the Green River. It would take us a few hours to reach that part of the river below. Back on the river again. Unfortunately, once we started to go around the Bowknot Bend, the wind started to pick up for the very first time on this trip. It meant we had to paddle even more to keep moving. Next we stopped at the very eastern end of the Bowknot Bend for lunch. While everyone else was eating, I hiked a short distance to a few old cabins from the uranium mining era. Inside one of the cabins was a counter covered with some old drill core samples. Nic keeping his eyes open for a vacant campsite. After passing the other side of the Bowknot Bend Ridge, it was time to start looking for another campsite, but this turned out to be the most difficult evening for us to find a site. We hadn’t seen very many people on the river the past three days, but as soon as we got on the other side of the Bowknot Bend it seemed that everyone on the river was camping in this area! Where did they all come from? All of the campsites we came across were occupied. We stopped at the mouth of Horseshoe Canyon to see if there was any place to camp there, but found nothing good at this water level. Shortly past there we found a small sandy island below Deadman Point that looked like it might work, and we decided to stay there since it was getting late and we were pretty exhausted again, especially after battling the wind all afternoon. Once our camp was setup we went for another swim to cool off since this was the first time we arrived at a campsite that wasn’t in the shade already. Then it was time for a dinner of leftover BBQ Beef sandwiches and spaghetti and meatballs since we had plenty of both left. The wind died down in the evening and it turned into another calm and beautiful night with plenty of light from the full moon. An evening view from our final campsite. A sunstar over the Green River. It wasn’t a very big campsite, but it was pretty nice. Steve’s tent under the stars at our little island campsite with the canyon walls lit up by the moonlight. At night we camp on the south side of the great Bowknot, and as we eat supper, which is spread on the beach, we name this Labyrinth Canyon. We woke up on Monday morning to another beautiful sunrise as more clouds were starting to move into the area. After having breakfast burritos we started to load our boats up for the final time and it started to lightly rain on us. The precipitation didn’t last long, but it would visit us a few more times as we paddled the last few miles of the river to the takeout at Mineral Bottom. We only had six more miles of river to go this morning and the wind was gone, so it was a short day on the river. There was a very colorful sunrise for our last morning on the river. Sunrise on The Frog near the mouth of Horseshoe Canyon. My inflatable kayak is ready for its final day on the river. As we approached the mouth of Hellroaring Canyon, I gave everyone the option of stopping to look at the second Denis Julien inscription that is located there, but they all declined so we passed it up since I had already visited this one at the end of a trip to The White Rim a few years ago. Here’s a photo of the inscription from that trip. Looking back to the mouth of Hellroaring Canyon after floating by. There were some nice reflections on the river this morning. The last stretch of the river to Mineral Bottom where we would take out and end the trip. Once we got our boats off the water we got everything loaded into Steve’s truck and drove back to Ruby Ranch. On our way we hit some very strong winds and were glad we got off the river early. Although we ended up paddling a bit more than I thought we would in order to keep moving at a reasonable pace, I had an amazing first trip through Labyrinth Canyon! I honestly couldn’t have asked for a better river trip through the desert of the Colorado Plateau. Not only was the weather great, we stayed at some awesome campsites and there were also no bugs at all the entire trip! It was great! In the future if I do this trip again, I think I would try to plan it when the water is just a little bit faster or when we would have more time, or I would use a faster boat like a hard-shelled kayak. No matter what, I really hope there is another trip in the future for me! It’s so cool to see these locations I’ve only seen from the trails. You take such fantastic photos, and it’s clear how much work you put into the reports. Kudos, and thanks for sharing with us!